In order for all students to succeed in PreK-12 education, programs and practices must be in place that recognize and address the various inequities students may face throughout their learning experiences. 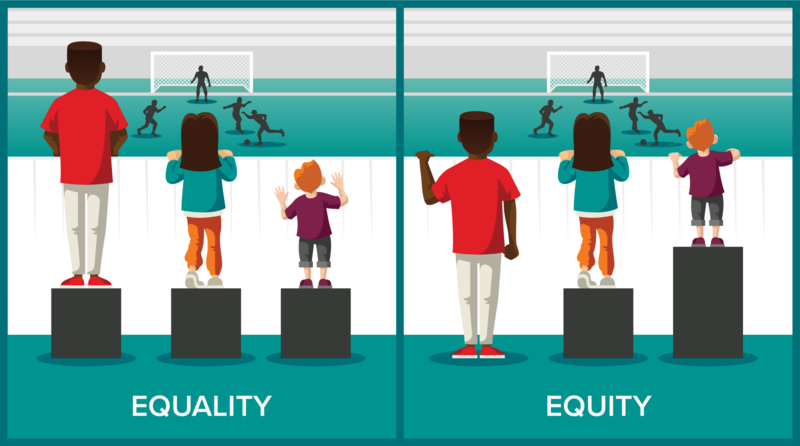 But it’s important for educators, policymakers, and all stakeholders to recognize the difference between equity in education, and equality in education. Researchers from the Connected Learning Alliance published a report that clearly illustrates the nuances of the difference between equity and equality, specifically through purposeful use of education technology. Take a look by reading the report, here. Social and emotional instruction should also be equitable, and not delivered “equally” to all students. We have more work to do in understanding exactly how to make that happen, and new research is always emerging. To start, we can turn to some of the research around supporting specific student populations with SEL, such as English Learners. For more on that, check out this article from eSchool News. It’s increasingly recognized that early childhood education is a particularly crucial space in ensuring equity for all PreK-12 students. But nationally, there are disparities in who benefits from quality preschool programs, and a great deal of work to do in ensuring that early childhood education is equitable. For more, check out these resources from the National Association for the Education of Young Children (NAEYC). Community and family engagement, emphasized under the Every Student Succeeds Act, can serve as a critical space where equity work can make a meaningful difference for students. Simply ensuring that a school makes an effort to communicate with all families isn’t enough, because family cultures and backgrounds could require a different approach to communication. While researchers are still working to identify best practices for equitable family engagement, this research review from Teachers College, Columbia University, is a great place to start. These examples are only a few of the many spaces that can be positively influenced by an emphasis on educational equity and a careful understanding of the difference between equity and equality. As researchers continue to identify persistent inequities, and educators continue to try out innovative practices in the classroom to strive for student empowerment, new pathways to equity will emerge. For now, we can strive for equity by paying close attention to identified areas of need, listening to our students and their families, and continuing to act on existing research. Friedman-Krauss, Allison H., et al. The State of Preschool 2017. The National Institute for Early Childhood Education Research, 2018, pp. 1–30, The State of Preschool 2017. Reich, Justin and Mizuko Ito. 2017. From Good Intentions to Real Outcomes: Equity by Design in Learning Technologies. Irvine, CA: Digital Media and Learning Research Hub. Weiss, Heather B., et al. Reframing Family Involvement in Education: Supporting Families to Support Educational Equity. The Campaign for Educational Equity , 2009, pp. 1–54, Reframing Family Involvement in Education: Supporting Families to Support Educational Equity.